The D-53Y is a new addition to the D-53 series. 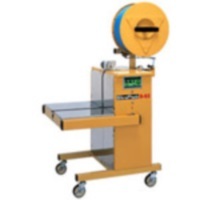 A side seal semi-automatic strapping machine is used in extremely hostile environments where moisture and debris would damage a conventional tabletop machine. 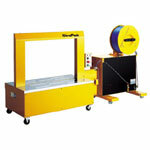 This machine is coated with rust resistant paint and is specially designed for food, lumber, brick and tile industries. 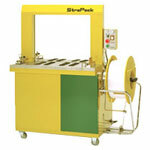 The strap dispenser located on the top of the strapping machine protects the strap from harsh environments. The high quality Strapack D-53Y comes with a 6 month warranty and guarantees great results. 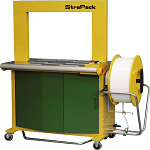 Boatman Marking has a full line of Strapack strapping machines and strapping equipment to fit your individual packaging needs.